A worker at a Florida Little Caesars shot and killed a man who was wearing a clown mask after he was attacked with a wooden post and scissors, officials said. A worker at a Little Caesars pizza shop in Florida fatally shot a man wearing a clown mask who attacked him with a wooden pole and scissors, officials said. The incident happened just before midnight Saturday as the employee was leaving the pizza chain's Holly Hill restaurant after closing, WESH reported. Police said the suspect hit the employee with a wooden pole until it broke then tried to stab him with scissors. The worker pulled out his gun, for which he has a concealed weapons permit, and fired several shots at close range. The attacker was taken to a nearby hospital where he later died. The employee, identified as Heriberto Feliciano, was hospitalized for face and shoulder injuries, police said. 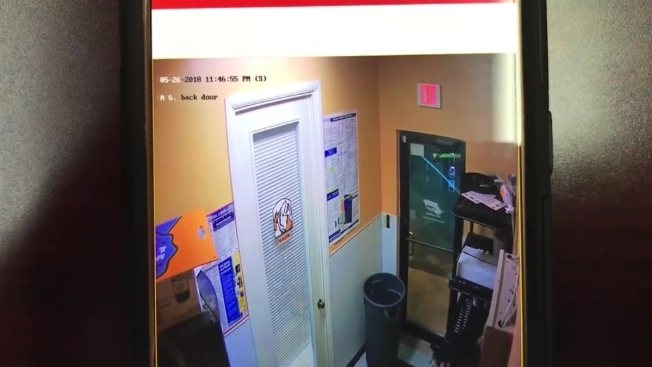 Surveillance video from the restaurant shows the suspect in the clown mask walking outside the restaurant and attacking the employee as he locked up the shop. Police haven't released the name of the suspect.